Israeli premier meets with US National Security Advisor in Jerusalem, as US plans withdrawal from Syria. Israeli Prime Minister Binyamin Netanyahu met with US National Security Advisor John Bolton at the Prime Minister’s Residence in Jerusalem on Sunday, a day after Bolton arrived in Israel, as part of a Middle East visit which will include a stop in Turkey for talks with Turkish President Recep Tayyip Erdogan, as the US prepares for a troop pullout from Syria. Joining Netanyahu and Bolton for the meeting Sunday evening were US Ambassador to Israel David Friedman and Israel’s Ambassador to America Ron Dermer. 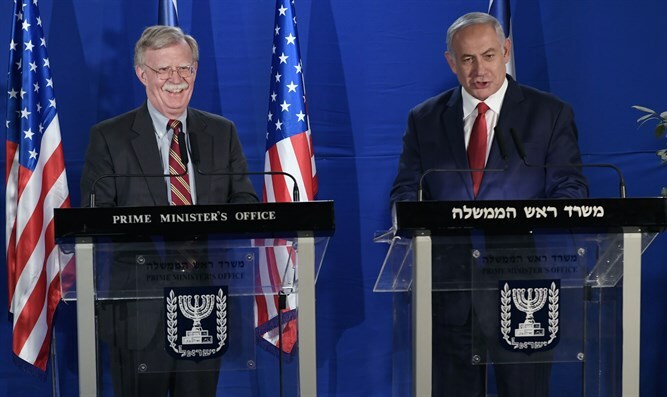 Following the meeting, Netanyahu and Bolton made a brief joint statement to the press. During the joint press conference, Netanyahu praised Trump for withdrawing the US from the 2015 Iran nuclear deal, and for the decision in December 2017 to relocate the US embassy in Israel to Jerusalem. "That's important to America, to Israel, and to the world. Everybody who wants to stop Iranian aggression respects that deeply." "You've also unequivocally backed Israel at the United Nations," Netanyahu added, "and that's something deeply appreciated by all Israelis." Bolton hailed the relationship between Israel and the US under the Trump administration, saying the bond between the two countries had never been stronger. “The leadership that’s necessary in what is increasingly…a very critical time for security here in the Middle East and us around the world, requires that strong bond and leadership that you and the president provide,” said Bolton, citing Iran’s nuclear program, the Syrian civil war, and the ISIS terror organization. Bolton also hinted that the US troop pullout from Syria, which President Trump announced last month, may be limited to American forces in northern Syria, leaving an enclave in Al-Tanf in southeastern Syria to prevent an Iranian takeover of the area. “Right on your border we have the problem of the conflict in Syria. We’re going to be discussing the president’s decision to withdraw…from northeast Syria in a way that ISIS is defeated and not able to revive itself and become a threat again, and to make sure that the defense of Israel and our other friends in the region is absolutely assured. And to take care of those who have fought with us against ISIS and other terrorist groups. “You know, for the United States, a sovereign nation's ability to defend itself is the ultimate mark of sovereignty. President Trump has said repeatedly that he backs Israel's right to self-defense. He says it proudly and unequivocally. The Trump administration has sought to reassure regional allies – including Israel, Saudi Arabia, and the Gulf States, that it will not permit an Iranian takeover of Syria following the US withdrawal. US Secretary of State Mike Pompeo is slated to arrive in the region on Tuesday for a series of meetings with leaders of Qatar, Saudi Arabia, Oman, Kuwait, Egypt, Bahrain, the United Arab Emirates, and Jordan. Earlier on Sunday, Bolton told reporters in Jerusalem that the Trump administration would “condition” the US withdrawal from Syria on guarantees from Turkey that Kurdish militias would not be targeted after Turkey moves in to fill the vacuum left by the US. In addition, Bolton said the US could leave forces at the Al-Tanf airbase in southeastern Syria even after troops are pulled out of northern Syria. Bolton said the US enclave in Al-Tanf could serve as a buffer, preventing Iran from expanding its presence in southern Syria.